How Can My Accent Wrap the Local in its Cloak? The In-Complete Poems, by David Howard (Cold Hub Press), 274 pp., $ 49.95; S(t)et, by David Howard (Gum Tree Press) 42pp. $70; China as Kafka, by Vaughan Rapatahana (Kilmog Press) 52 pp. $65. 141 of David Howard’s poems in 261 large pages before notes and index, some poems short and pithy, some expansive and densely detailed. Numbered and arranged in order from the earliest (1976, when the poet was 17) to the most recent at the time of publication (2010–11), and with endnotes drawing attention to which ones won prizes. A comprehensive collection of the poet’s work to date then, or at least as comprehensive as the poet-editor wants it to be. ‘In their definitive versions … those poems that I am prepared to stand beside’, he says in the blurb. Doubtless some work hasn’t made the cut. But ‘In-Complete’ (note the hyphen arranged artfully on both cover and title-page) because only dead poets’ work may truly be called complete. David Howard, aged 53, is still very much with us. He has more to write. For the moment, though, these are the Collected Poems of David Howard, and with the poet’s work presented chronologically, we are implicitly invited to see how his mind and methods have developed over three-and-a-half decades. Yet in spite of the very odd topical reference, there are more continuities than disjunctions in Howard’s 35-year collection. The concern for fine art enters early on, with a cycle of poems like The Portrait Gallery (written when Howard was in his twenties) very much an hommage to Baudelaire’s Les Phares. Many later poems respond to specific artworks, or were in some cases part of a commission for multi-media events. Another continuity is the attempt to see things, such as politics, in both their immediate aspect and sub specie aeternitatis. This is found in Howard’s early ‘play for voices’ (written over a number of years) The Carrion Flower, on the assassination of Heydrich. Howard wants to diagnose the ongoing significance of the ephemeral event. He materialises as dour metaphysician — the man who would turn his face towards the sun and away from the shadows on the wall of Plato’s cave; and the man who must rebuke us for our illusions and superficiality. No surprise, then, that specifically Christian religious allusion also establishes itself near the beginning of Howard’s collection, with repeated images of votary candles and with an Anzac Breviary (from the mid-1980s) arranged according to the canonical monastic hours. In terms of personal belief, how does Howard stand with God? I haven’t the faintest idea. But I do know that, as a poet, he often can’t do without Him. God-haunted, the 2001 cycle Confound the Language avers that ‘God [is] not so much dead as missing in action’, sees ‘the Sabbath’ in a woman’s ringlets, and references Jesus’ miracles and resurrection. Sure, the epigraph for Confound the Language is from Lou Reed’s Heroinwhere the drug-addled one claims he feels ‘like Jesus’ son’, confusing pharmacology with theology just as finer spirits than he (Baudelaire again) have occasionally done. But the religious touch is still there. As in 2003’s A Mother’s Story with the Virgin Mary. As in 2011’s Remember We Them Will, where God sets off the Christchurch earthquakes. To speak of such continuities is to report only part of the story, however. The poems’ attitudes towards sexual encounter change significantly as the poet ages. Getting There, from 2002, is a harsh and pithy rendering of the theme that love can be possessive egotism, where a man wants from a woman ‘a portrait rather than a person’ and thinks “more of his disappointment than [of] her.” 2009’s Country Life says ‘come middle age/ [love is] a curiosity, abandoned like the tractor in a fallow field, / where there were tracks’. There are fewer celebrations of women (or a woman) than there were in earlier poems. Even so, in the same year as Country Life, the cycle For Rowena offers us a frank account of unsatisfactory adolescent sexual fumbling. I detect a greater interest in themes of cultural dislocation in Howard’s more recent poetry. He is a New Zealander, so he cannot avoid that Pakeha condition of knowing that High Culture comes from Elsewhere, and that in this land we have both shallow ancestral roots and an uneasy relationship with another people. A tough little historical vignette like Te Kooti (2004) reminds us so. The Held Air is an elegy lamenting a man’s death, but also reproving him for his ignorance of Maori lore. The breakthrough poem for this uneasy Pakeha consciousness is 2001’s Unseasonal, a generous paste-up of nineteenth-century settler allusions. The peak of such concerns — and Howard’s finest single poem — is the two-part quasi-saga The Word Went Round (2005), dense in time-specific imagery and references and giving an account of a nineteenth-century Irish immigrant’s loss of homeland and first disoriented encounter with New Zealand. He asks ‘How can my accent wrap the local in its cloak?’ and, having no new identity yet stamped on him, feels ‘like a bull / tethered for branding.’ Nor does this tension die with the nineteenth century. Taking a cue from Vincent O’Sullivan’s Butcher, Dead Man Blues still sings of people who are here, but spiritually unaccommodated. So far, I have been ticking off, rather mechanically, the thematic features of Howard’s work. I am, of course, being very evasive and trying to avoid making judgments. As a purely subjective reaction, I found many of Howard’s earlier poems, even after repeated close readings, opaque to the point of incomprehensibility, and wonder if this was not a case of the younger poet striving rather too hard to establish his intellectual credentials. Howard improves with age and shows a firmer grasp of form in his more recent work. Appropriate to one who has a second career as a pyrotechnician, Howard also likes visual display. Distinctive typographical presentation is a major feature of some poems. Momentarily, the crescent-shaped stanzas of the first half of The Word Went Round distracted me by reminding me of the Mouse’s tale in Alice in Wonderland. The effect soon faded as the poem’s mastery of detail asserted itself. More troubling — and harder to decode — are those poems printed in ‘split’ alternative voice-forms down the page, right side complementing, or responding to, left side. I appreciate that this is in a tradition as old as the call-and-response of a field holler (or the strophe and antistrophe of a psalm), but found the dilemma of reading down or across the page a major distraction from each poem’s sense. In the larger context, this is a quibble. The In-Complete Poems is the substantial summation of a poet who has matured in his craft, even if many of his interests are constants. A brief note on David Howard’s S(t)et. It is the large and attractive presentation of four poems also found in The In-Complete Poems, but very much an objet d’art in its own right – a limited edition, all signed by the author. I delight in Howard’s stroppy afterword in which he says damn the torpedoes as far as worrying about the popularity of poetry is concerned. 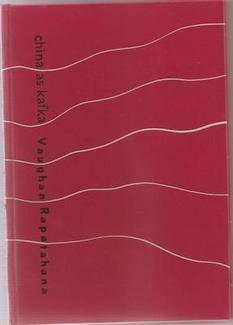 Vaughan Rapatahana’s collection (a hardback limited edition) China as Kafka works through some interesting experiences. His recent time in Asia is recorded in encounters with downtown Hong Kong traffic, mass transit railways, a visit to Angkor Wat, seeing a Good Friday procession of flagellants in the Philippines, and so on. And there are earlier New Zealand memories — watching cricket as a teenager, being part of a gang cutting cemetery weeds, arguing with (apparently) a father, being in an anti-war demo. The bursts of Maori language are usually translated. The title poem is a sort of surreal protest at modern Chinese government gangsterism, although to justify its title it would really need more Kafka than it references. Rapatahana is better when he states rather than explains. Even in the fragmented forms he uses, he does have the tendency to dart in and tell us what to think, with an over-deployment of epithets. Imagery sometimes falls apart. Cars are ‘wheeling impedimenta’ (why ‘impedimenta’?). Railway carriages are ‘strutting caskets’. They may well be caskets but is ‘strutting’ appropriate to their form of movement? As for Angkor Wat, it’s ‘these/ phallic/ plinths/ shooting/ their/ stuff/ way/ above/ the sagging scrotum of stuttered stone’. Well forgive me if I hear schoolboy-sniggering in this. I admit to being alienated from the page-filling typographical tricks. I appreciate that printed pattern-poems are intended to appeal visually as much as verbally. The look of them on their page is part of their craft. But that dread question ‘Why?’ explodes when reading page after page of them. Is there really meaning to be had in the printing tricks of words sloped and s t r e t c h e d or isolated single to the line? Sometimes the visual presentation matches sound or meaning. But too often it seems merely a tic or affectation repeated pro forma. NICHOLAS REID is an Auckland historian, critic and poet. His publications include James Michael Liston – A Life (VUP, 2006) and his poetry collection The Little Enemy (Steele Roberts, 2011).